When developing new drugs, structural analysis of impurities and metabolites is a critical process that cannot be avoided. 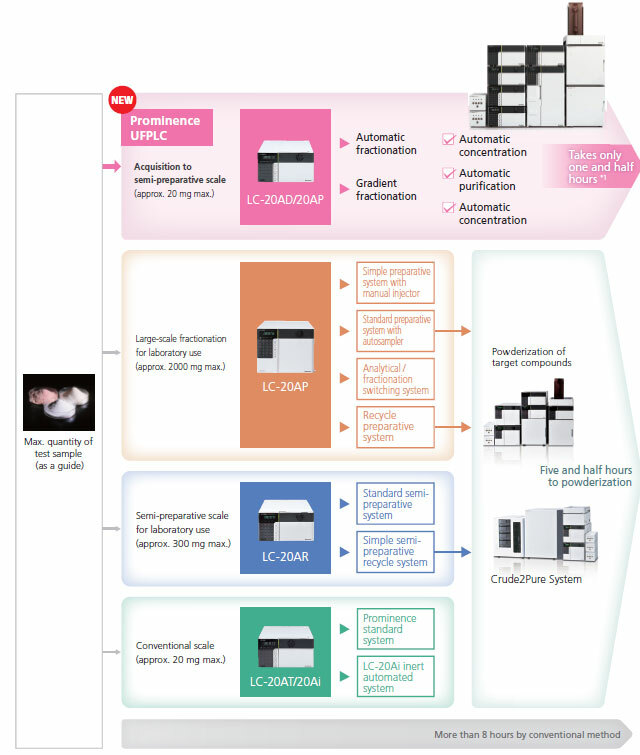 However, structural analysis after synthesis or purification by preparative LC is time-consuming and recovering high-purity samples is very difficult. Therefore, as a solution to this problem, Shimadzu offers the Crude2Pure system, which recovers target compounds in high-purity powder based on a revolutionary purification method that involves using two purification systems. 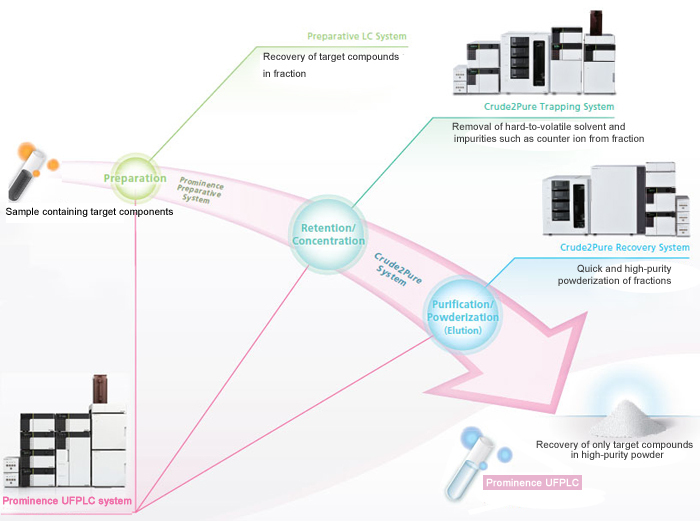 The Ultrahigh-Speed Preparative Purification System, Prominence UFPLC system, the newest addition to Shimadzu’s family of purification systems, inherits the same purification method as the Crude2Pure, but handles all steps, from fractionation to purification, within a single system, so that target compounds can be recovered in high-purity solution. The Prominence UFPLC system uses the LC-20AD/AP solvent pump for preparative purification. The LC-20AD/AP is able to deliver low-pressure gradients for supporting applications ranging from analysis to semi-preparative-scale operations. Fractionation, concentration, purification, and recovery processes are fully automated to provide a new online purification solution. *1 Total time depends on the combination of Prominence UFPLC and Evaporation system (provided preparative time is 30 min). Note: Contact your Shimadzu sales representatives for details about configurations, specifications, etc. This is the most basic Prominence UFPLC system. Automated Preparative Purification is available when there is only one target compound. 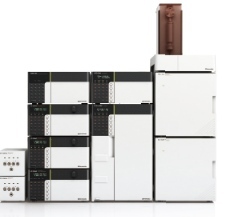 This is a fully automated system to purify several compounds, including the main target compound, residual substance and impurities (five kinds at max. ), from a preparative sample. 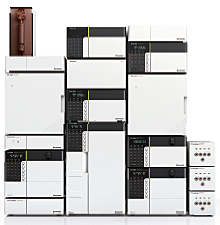 Mobile phases used for HPLC separation for pharmaceutical components sometimes include compounds like trifluoroacetate that form counter ions. If such components are included in preparative fractions, they can cause problems during drying or testing after purification. 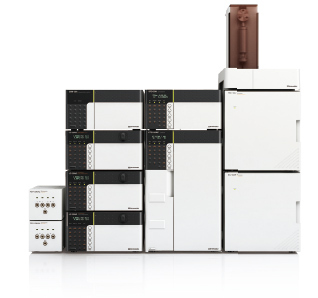 However, the Prominence UFPLC system is able to easily eliminate such components that may be contained in fractionated liquids. Depending on the elimination method selected, target compounds can also be recovered in freebase form, in addition to eliminating components from the mobile phase. 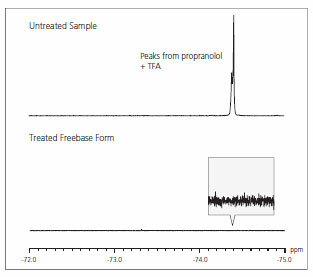 Two 0.1% TFA propranolol solutions were prepared, with one treated as a freebase, and then the solvent evaporated. The 19F NMR spectra from these two samples are shown. 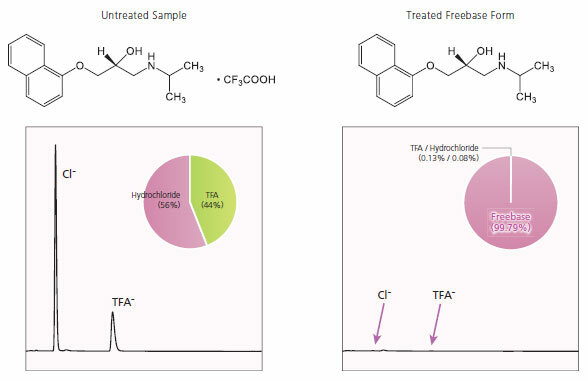 The TFA peaks are much smaller for the sample with freebase treatment than for the untreated sample, which indicates that the process was effective in eliminating TFA. With the dedicated Purification Solution software, the analysis status can be quickly confirmed at a glance using the peak tracking function. To ensure reliable fractionation and purification of precious samples, the Purification Solution software offers three fractionation modes. In this mode, the software automatically identifies peaks and collects fractions based on parameter settings. Fractions can also be simulated in advance by opening acquired data using the simulation function, which optimizes parameter settings. It also supports calculating multiple theoretical detector signals. In this mode, the mouse pointer is used to select peaks for fractionation while viewing the window. When concentrating a sample by reinjecting it multiple times, the function remembers the timing of the first fraction, so that the fraction is automatically performed at the specified time for each injection thereafter. This mode collects fractions based on the retention times in previously acquired data. It is ideal for routinely performed preparative purification processes.